Anyone healthy enough may undergo dental implant surgery. You must have healthy gums and bones in order to hold the implants in place. Your commitment to oral hygiene and frequent dental visits is also critical. Heavy smokers, people who are suffering from uncontrolled chronic disorders, or patients who have undergone radiation therapy in the head or neck area should undergo a thorough health evaluation to assess if their health can support the strain of having dental implants. The first step in the dental implant process is the creation of an individualized treatment plan. The plan specifies the patient’s needs after examination by a team of doctors specialized in oral surgery and restorative dentistry. The dentist team chooses the appropriate implant option based on their findings during the examination. The titanium tooth root implant is then inserted into the bone socket of the missing tooth. The jawbone grows around the root implant as it heals, making the implant permanent. This process takes 6 to 12 weeks. 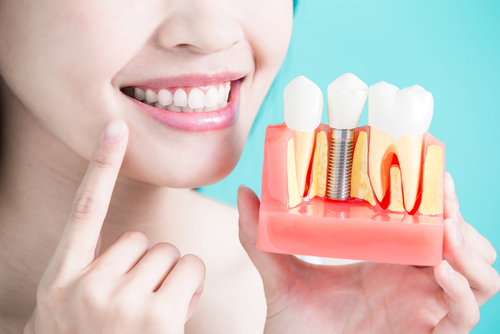 The abutment, an object that connects the root implant and the artificial teeth, is then connected to the implant. The dentist then makes use of the entire mouth as a basis for the creation of the new tooth. The artificial tooth, or crown, is then connected to the abutment. Most people who have undergone the dental implant operation reported to have very little discomfort during the operation, and some people even state that tooth extraction is more painful than dental implants. Local anesthesia is administered during the operation and soreness after the operation may be treated with over-the-counter pain medications.